Road Block was Norman Rockwell's 260th painting, and was his 3rd painting to appear on the cover of The Saturday Evening Post in 1949. Road Block is the perfect example of Norman Rockwell's small town American charm. 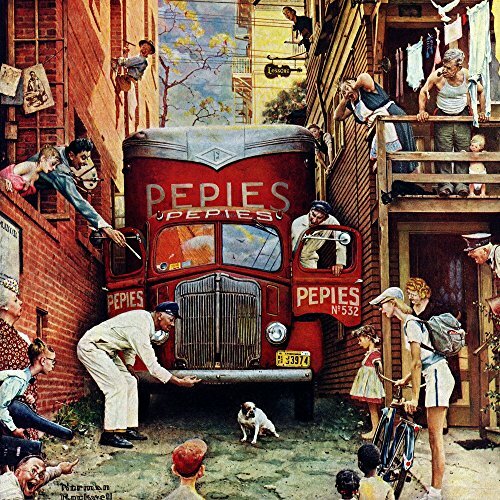 In this painting, Norman Rockwell shows us Norman Rockwell was one of America's leading artists. He chose to tell the story of the American dream, the detail of a simpler time, painted with warmth and humor. He tapped into the nostalgia of the American people with paintings that were often idyllic and expressed enthusiasm for the ordinary. In preparations for a painting Norman Rockwell would set up a scene, using his friends and neighbors, taking hundreds of photos until satisfied. Rockwell would then produce the painting in charcoal, oil and then finish with the final image. Our fine art prints from the Marmont Hill Art Collective display sharp, clear images. Our high quality reproduction allows you the best of both worlds: quality and affordability. Our art prints are: Professionally hand stretched Norman Rockwell art prints Gallery wrapped in sustainable, FSC certified wood Norman Rockwell prints arrive ready to hang All of our prints are made in the USA Includes a certificate of authenticity Multiples sizes available to fit your needs for any room At Marmont Hill Art Collective we have an extensive collection of Normal Rockwell's famous art prints in many different categories that relate to family, life, love, Scouts of America, and of Rockwell's most well-known work. You are sure to find the exact art print to fit your decorating needs whether it be for your bedroom, bathroom or living room. Our sizes come in 18x18, 24x24, 32x32, 40x40 and 48x48. With so many sizes to choose from we have a size to fit any room.